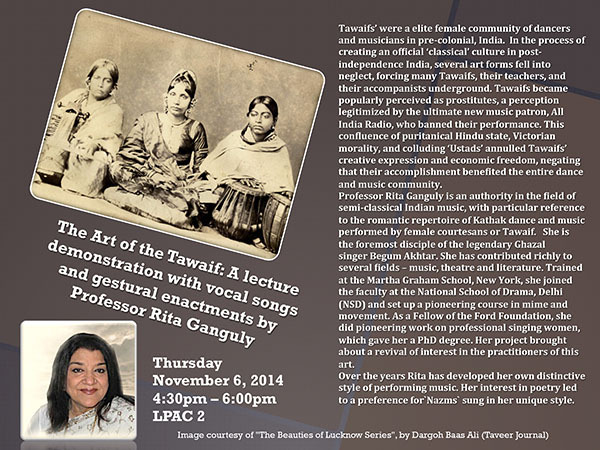 Tawaifs’ were a elite female community of dancers and musicians in pre-colonial, India. In the process of creating an official ‘classical’ culture in post-independence India, several art forms fell into neglect, forcing many Tawaifs, their teachers, and their accompanists underground. 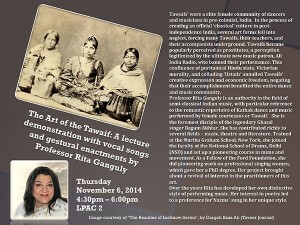 Tawaifs became popularly perceived as prostitutes, a perception legitimized by the ultimate new music patron, All India Radio, who banned their performance. This confluence of puritanical Hindu state, Victorian morality, and colluding ‘Ustads’ annulled Tawaifs’ creative expression and economic freedom, negating that their accomplishment benefited the entire dance and music community. Professor Rita Ganguly is an authority in the field of semi-classical Indian music, with particular reference to the romantic repertoire of Kathak dance and music performed by female courtesans or Tawaif. She is the foremost disciple of the legendary Ghazal singer Begum Akhtar. She has contributed richly to several fields – music, theatre and literature. Trained at the Martha Graham School, New York, she joined the faculty at the National School of Drama, Delhi (NSD) and set up a pioneering course in mime and movement. As a Fellow of the Ford Foundation, she did pioneering work on professional singing women, which gave her a PhD degree. Her project brought about a revival of interest in the practitioners of this art. Over the years Rita has developed her own distinctive style of performing music. Her interest in poetry led to a preference for`Nazms` sung in her unique style. This entry was posted in Dance on November 3, 2014 by twebb1.